Security operatives have apprehended a fake yahoo boy who has been terrorizing residents of Benin. A fake yahoo boy who has been terrorizing Benin, has been nabbed with the help of CCTV after he went burgling again. 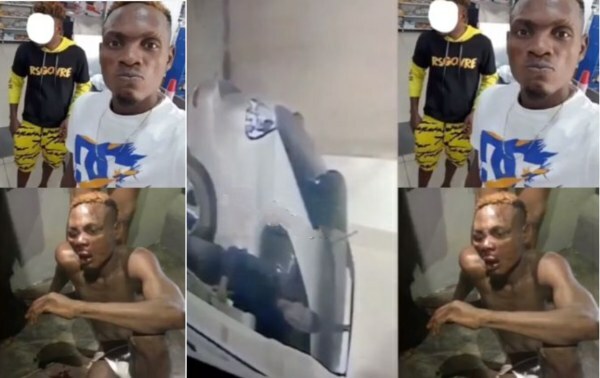 The fake yahoo boy who terrorized residents of Benin, reportedly operated at night with the aid of assorted charms which made his victims fall deeply asleep. The suspect who burgled over 25 houses at PZ, Sapele road, Benin, is said to have a potent charm which aids him in stealing right under people’s bed without them waking up. He however ran out of luck after his last operation, as his identity was uncovered by a CCTV which also captured moment he brought out his charm and made some.